England Euro 2016 squad: Who is going to France and who is staying? England's defeat by the Netherlands at Wembley on Tuesday was the last international before manager Roy Hodgson names his squad for Euro 2016 this summer. Hodgson will have most of his squad for France firmly fixed in his mind - and domestic form and match fitness will be the key factors in any late changes to his plans before the official announcement on 12 May. Which England players can count on a place at Euro 2016? Who are the men still fighting for places? And who can make plans for their holidays? Joe Hart (Manchester City) Age 28. Caps 57. Currently sidelined with injury but England's undisputed number one choice in goal. Will assume the same responsibility he did at Euro 2012 and the World Cup in Brazil in 2014 - if Hodgson's side are to succeed, he will need to be at his best. Fraser Forster (Southampton) Age 28. Caps 5. The Southampton giant has made an impressive return to action after a serious knee injury and is now the very obvious deputy to Hart after Jack Butland broke an ankle in the friendly win against Germany in Berlin. Nathaniel Clyne (Liverpool) Age 24. Caps 11. Goals 0. The Liverpool defender has not yet proved he is of the highest class at international level - but there is a shortage of quality English right-backs, so he is likely to be fighting it out with Tottenham's Kyle Walker for a starting place at Euro 2016. Kyle Walker (Tottenham) Age 25. Caps 14. Goals 0. Looks to be in a straight fight with Clyne for the right-back spot and has the chance to edge ahead if he can help Spurs win the title. John Stones (Everton) Age 21. Caps 8. Goals 0. Stones is a stylish central defender with the potential to become world class. He has experienced a dip in form and fortune at Everton this season but is still a certainty to travel to France. Stones was a very mixed bag against the Dutch at Wembley but will have a very good chance of making England's team against Russia for the Euro 2016 opener in Marseille if he shows his true form in the coming weeks. Gary Cahill (Chelsea) Age 30. Caps 41. Goals 3. Fortunate not to have sterner competition for central-defensive places after a mixed season at Chelsea and a clear vulnerability against strikers of the highest calibre, as proved against Germany. He will still be in France, when Hodgson will hope he can rediscover some of his old authority. Chris Smalling (Manchester United) Age 26. Caps 23. Goals 0. The Manchester United defender has been very much a project for Hodgson since his early days when they were together at Fulham. Still has some positional problems but development elsewhere means he looks certain to start England's Euro 2016. Phil Jagielka (Everton) Age 33. Caps 39. Goals 3. Everton's experienced captain is unlikely to make England's starting line-up in central defence - in an ideal world this would be Smalling and Stones - but will fill a role as experienced back-up in that position, as will Cahill. Still showed uncertainty in cameo as substitute against the Netherlands. Jordan Henderson (Liverpool) Age 25. Caps 23. Goals 0. Another player short of true international class but his energy and enthusiasm make him a squad certainty and a player Hodgson feels he can rely on. Eric Dier (Tottenham) Age 22. Caps 4. Goals 1. Hodgson has been looking for a solid midfield presence with Manchester United's Michael Carrick in decline and Arsenal's Jack Wilshere, used in that role, regularly injured. Dier has made a seamless transformation from central defender to midfielder with such confidence that it is easy to see him starting for England when they face Russia. Ross Barkley (Everton) Age 22. Caps 21. Goals 2. Recovered well from a poor campaign last season to show flashes of the skill that make him such a special, unpredictable talent. Tottenham's Dele Alli may just have pushed him out of a starting place but his ability to change a game in a moment means he must be on the plane. James Milner (Liverpool) Age 30. Caps 58. Goals 1. England's 'Mr Reliable' - may not even get a game but his all-round solid ability and attitude have made him a comfort blanket for a succession of England managers. He will go. Dele Alli (Tottenham) Age 19. Caps 6. Goals 1. Alli has moved from White Hart Lane rookie to one of the premier names on Roy Hodgson's team sheet in just a few months. This is testimony to his quality, versatility and temperament. Wowed the watching Berlin gallery with a consummate display in the friendly win against Germany. Adam Lallana (Liverpool) Age 27. Caps 21. Goals 0. Makes a sound, if unspectacular, contribution to Hodgson's England and is clearly someone the manager feels he can count on. Harry Kane (Tottenham) Age 22. Caps 10. Goals 4. Premier League top scorer with 21 goals this season, but more significantly for Hodgson looks just as composed and comfortable on the international stage as he does domestically. Kane has a goalscoring instinct and range of game and positional sense that now make him England's first-choice striker. Wayne Rooney (Manchester United) Age 30. Caps 109. Goals 51. Plenty of debate about whether Rooney will be kept out of the side by the likes of Kane and Jamie Vardy. There should be no word of debate about whether he should be on the plane. A must. Rooney will also go as captain, a role he has fulfilled superbly, and still possesses the ability to have an impact at the highest level. Jamie Vardy (Leicester City) Age 29. Caps 6. Goals 2. Carrying his surge of confidence that has helped Leicester City to the top of the Premier League into England's team. Magnificent first international goal in Germany, an audacious near-post flick, and has the sheer pace to trouble any team in the world, either from the start or as an impact substitute. Man of the match when scoring against the Dutch. Danny Welbeck (Arsenal) Age 25. Caps 34. Goals 14. Unsung hero of England's squad - just look at his international goals record. 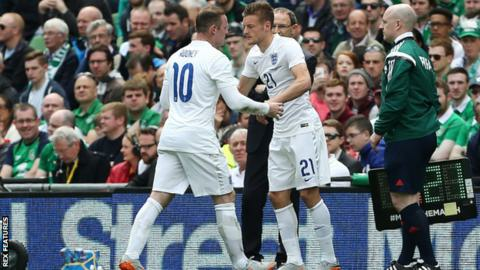 Hodgson loves Welbeck and trusts him completely. Knows he can fulfil any role he requires selflessly, either as a central striker or playing wide. Do not bet against him figuring prominently at Euro 2016. Tom Heaton (Burnley) Age 29. Caps 0. Heaton has had another fine season at Burnley as they chase a return to the Premier League and Butland's injury means he now has a great chance of travelling to Euro 2016 as third-choice keeper behind Hart and Forster. Good end to this campaign should seal his place. Danny Rose (Tottenham) Age 25. Caps 2. Goals 0. Maturing at White Hart Lane this season as Spurs chase their first title since 1961. Now near the front of the queue with Manchester United's Luke Shaw still recovering from a broken leg and no obvious clear first choice at left-back. Ryan Bertrand (Southampton) Age 27. Caps 7. Goals 0. Will have been disappointed not to be able to press his claims against Germany and the Netherlands after being ruled out through injury, but right at the forefront of Hodgson's thinking and in with a real chance. Leighton Baines (Everton) Age 31. Caps 30. Goals 1. Had a disappointing World Cup in Brazil and has seen his season at Everton disrupted by injury. He may now be behind Rose and Bertrand. Needs a big end to this term to prove to Hodgson he is worth a seat on the plane. Luke Shaw (Manchester United) Age 20. Caps 6. Goals 0. Long shot as he makes his recovery from the broken leg he sustained against PSV Eindhoven in the Champions League in September. But he is scheduled to return to training soon and hopeful of making some sort of contribution before the end of the season. If he impresses and shows he is back to fitness, then there is every chance Hodgson will seriously consider selecting this outstanding young left-back in a position that has not yet been nailed down. Jack Wilshere (Arsenal) Age 24. Caps 28. Goals 2. The great imponderable. We know Hodgson would have him in the squad (and probably the team) in an instant - just think back to his two superb goals that helped England beat Slovenia 3-2 in June. How can he be considered, though, without a game to his name this season? Hodgson will be desperate for him play, and impress, to help him solve a thorny problem. Fabian Delph (Manchester City) Age 26. Caps 9. Goals 0. Delph made a very decent contribution as England won 10 qualifiers out of 10 to reach Euro 2016 but his first season at Manchester City has been interrupted by injuries and he will feel anxious about making the squad. Danny Drinkwater (Leicester City) Age 26. Caps 1. Goals 0. Made a steady international debut against the Netherlands on Tuesday and is deservedly right on Hodgson's radar but will need to keep making that good impression. Winning a Premier League title is not a bad way to do it. Daniel Sturridge (Liverpool) Age 26. Caps 17. Goals 5. Arguably England's most naturally gifted, but also most physically fragile, striker. If fully fit and playing for Liverpool he is an absolute certainty to go to France - any more injury problems between now and the end of the season leaves Hodgson with a dilemma. Theo Walcott (Arsenal) Age 27. Caps 43. Goals 8. Seemingly a fading force for club and country on recent evidence and will need to show a lot more to convince the doubters in the weeks ahead. Alex Oxlade-Chamberlain (Arsenal) Age 22. Caps 24. Goals 5. Simply hasn't trained and a player who might have been a certainty for inclusion not many months ago is now in real danger of finding himself on the outside looking in. Raheem Sterling (Manchester City) Age 21. Caps 20. Goals 2. Transitional season for his club and yet to fulfil his potential. Should be a certainty but currently recovering from injury. If he does come back in time, then he can take his seat on the plane but he is by no means a certain starter. Ben Foster (West Bromwich Albion) Age 32. Caps 7. A long spell out through injury has allowed Burnley's Tom Heaton to jump the queue in England's goalkeeping line of succession. His best hope now is that, with Butland out, Hodgson reverts to a preference for someone who has played for England - but unlikely. Phil Jones (Manchester United) Age 24. Caps 20. Goals 0. Hodgson has tried Jones in a variety of positions from right-back and holding midfielder to his favoured central defence without him ever resembling an international player. Too much time on the sidelines again this season and too much of a risk. Kieran Gibbs (Arsenal) Age 26. Caps 10. Goals 0. Now looks to be fourth in a two-horse race for the left-back slot. Missed the opportunity to play against the Netherlands as cover because he was on holiday having not been called up initially. Unlikely to make the breakthrough for France now. Michael Carrick (Manchester United) Age 34. Caps 34. Goals 0. Carrick's performance in England's 2-0 loss to Spain in Alicante in November was another example of his inability to control and dictate games at the highest level. Not going to change now. Mark Noble (West Ham United) Age 28. Caps 0. Been something of a cause for West Ham United's fans but if he has not been called up now he never will be. To hear England boss Hodgson mention his name in the same breath as Grant Holt in Germany did not sound good for his prospects. Jonjo Shelvey (Newcastle United) Age 24. Caps 6. Goals 0. Looked to have revived his England career when he played a part in the Euro 2016 qualifiers but has disappeared, and even a £12m move to Newcastle has not revived his hopes. Tom Cleverley (Everton) Age 26. Caps 13. Goals 0. Has had a decent season at Everton but has now drifted away from the England scene. He can forget about a place in France. Andros Townsend (Newcastle United) Age 24. Caps 10. Goals 3. Looked at one time like a player who could really flourish under Hodgson for England with his pace and eye for goal, but was pushed to the margins at Spurs to kill that momentum and, like Shelvey, a move to struggling Newcastle has not helped. Marcus Rashford (Manchester United) Age 18. Caps 0. No room for a 'bolter' in this England squad, a la Theo Walcott's inclusion in Sven-Goran Eriksson's 2006 World Cup squad - but this outstanding young player's time will come before too long. Andy Carroll (West Ham United) Age 27. Caps 9. Goals 2. Any short burst of form and fitness brings suggestions that he could be back on to the England scene - but neither ever lasts long enough to turn promise into end product. No place for him in the current set-up. Saido Berahino (West Bromwich Albion) Age 22. Caps 0. Was considered a certain full England international at one point but is nowhere near contention after a proposed move to Spurs never came off and he drifted in and out of the West Brom side.